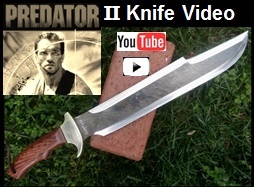 Billy’s Predator Knife II – Influenced by the move Predator. See Pictures, Prices, and Descriptions. Made by Scorpion Swords & Knives. This Version II knife is influenced off the knife Billy used in the movie Predator. Billy Sole was a mercenary, hired by the CIA as part of the Schaefer squad for a rescue mission. They came into contact with a Predator that stalked and killed the mercenaries one by one. Billy died challenging the Predator in hand to hand combat, armed only with his knife.